I appreciate the little details in the apartment,beautifully designed and spotlessly clean.You literally won’t have to buy anything cuz it has everything you need to have a good holiday.The view from the balcony is amazing too,and Rachel has more than once delivered breakfast pastries to us which is very thoughtful.We loved the apartment and really enjoyed our stay. Excellent hospitality of the host. Great attention to little details. Really made to feel at home. Well supplied and stocked room. Great decor. All around excellent! Everything was perfect! The room was clean, Rachel and Madeline were preparing us fresh fruits every morning. We also had the fridge full of goodies. Very calm, peaceful place with amazing view looking to the tropical garden and ocean sound. The owner is very nice person who always ready to help. We were welcomed very warmly and after the long trip it was so good to find some food, fruits, chilled prosecco and soft drinks provided by hosts in the fridge! The property is exceptionally clean and well maintained. 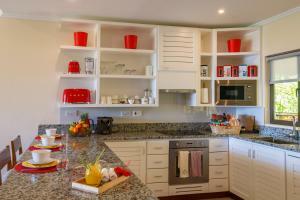 You will have 5*hotel apartments kitchen with all appliances that you need. The nearest beach is only 5 min walk, but better to drive somewhere else as Anse Intendance for instance. Strongly recommend. The look and feel of the place are just so inviting, it is super cozy and quiet, flowers growing everywhere you look, hostess and her staff are absolutely amazing, they were one step ahead of us every time coming up with solutions and ideas before we even think about it. Garden view apartment is amazing, sitting at the veranda feels like sitting in paradise, it's just so beautiful. 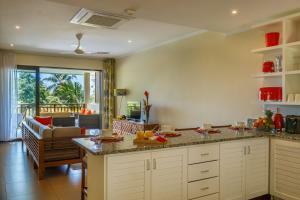 The apartments are equipped with amazing appliances, they keep everything very very clean. Considering the overall service I think this is if not #1 then surely one of the top 3 places I've ever stayed in. 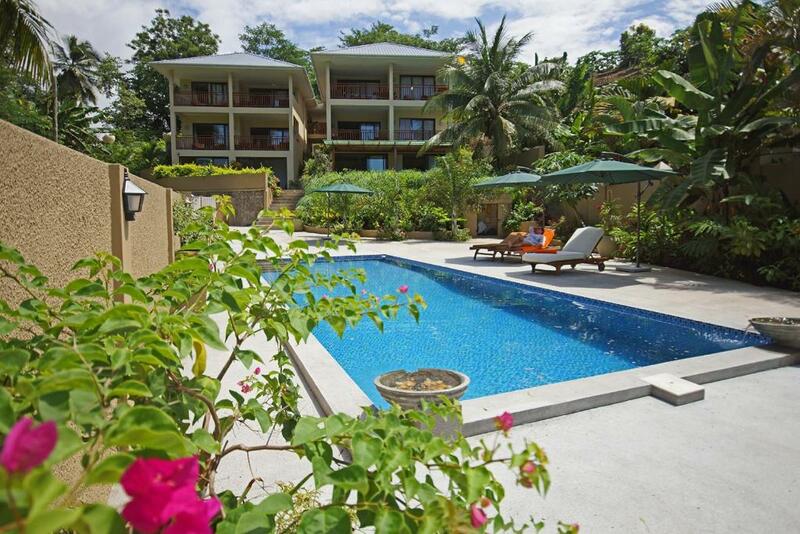 Without doubt one of the favorite places that we stayed (ever) during our time in Seychelles. Upon arrival we were welcomed by Rachel with her warm smile, our apartment was fully stocked with all the essentials and more, even had alternatives for my dairy allergy. This place is perfect for a family that is looking to reconnect or romantic get away for a couple. We truly enjoyed being among the hills, the scenery is beautiful. We had five great evenings here, attached pic of sunset from our balcony. Eden hills is not a 5-star hotel, but the atmosphere is so special that it really felt like home to us. Every thing in the apartment is handpicked and no detail is spared, there are even sand toys if you missed packing one for your kids. All respect for Rachel and her team that do a great job here; a true sample of excellent hospitality! Missing this place already and can’t wait to be back again!!! Ashwin, Shilpa, Anya and little Ava. We asked for an early check in, and Rachel was very nice and recived us earlier. Also the fridge was full of products and beverages for breakfast, and not only! We loved it! 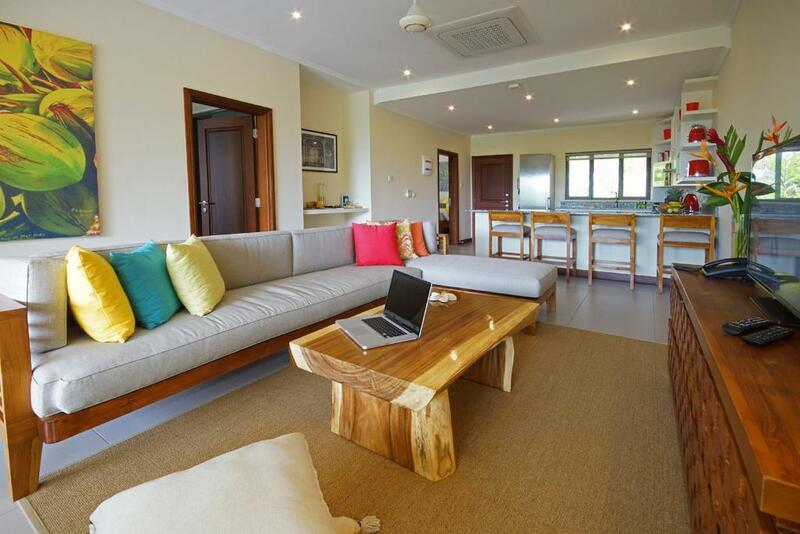 Amazing property and service that will make you feel home away from home. Cleanliness, everyone super helpful and welcoming and going extra mile to make your stay perfect (fridge full of treats upon arrival, fresh croissants baked for breakfast or even coconut cake prepared for us as a surprise). Any questions you might have you receive the best recommendations. The location of the Residence is convenient for exploring west coast both to the north and south direction. Would return whenever possible ! 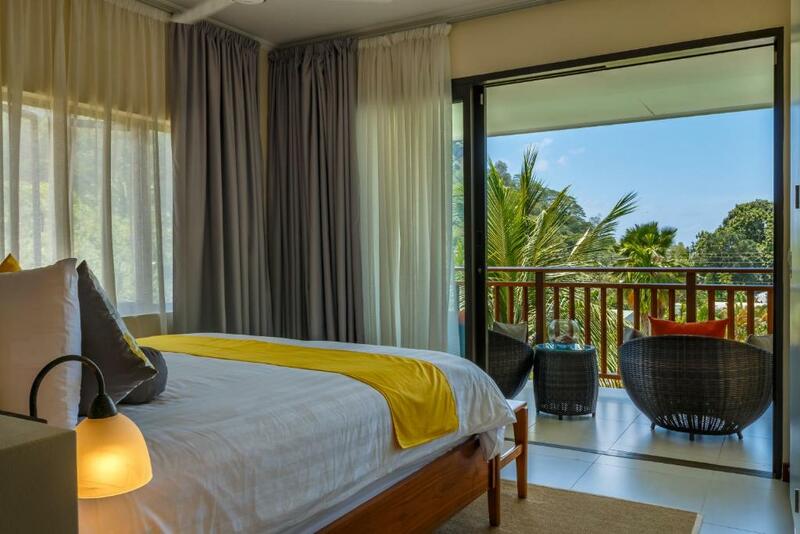 Lock in a great price for Eden Hills Residence – rated 9.9 by recent guests! 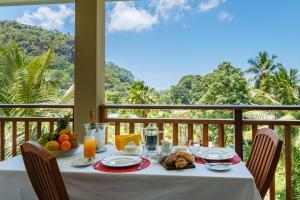 Offering accommodations with air conditioning, Eden Hills Residence is located in Anse Boileau, 4.3 mi from Anse Royale. Each unit at Eden Hills Residence has a fully-equipped kitchen, including an induction hob, coffee machine and dishwasher. They each have a dining area, large flat-screen TV and balcony. The units feature a private bathroom with a shower, bathrobe, hairdryer and free toiletries. Other facilities include a telephone with free local calls, a bluetooth speaker and card games. Beach towels and a beach bag are provided. Eden Hills Residence also includes an outdoor pool. A cleaning service is provided daily and the property also offers grocery delivery. You can engage in various activities in the area, such as diving, fishing and hiking. 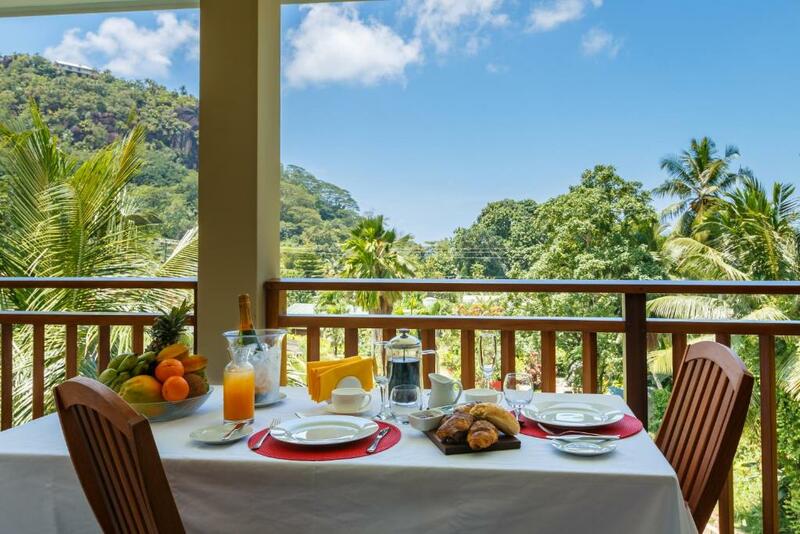 Victoria is 13 mi away, while Seychelles International Airport is 7.5 mi from the property. 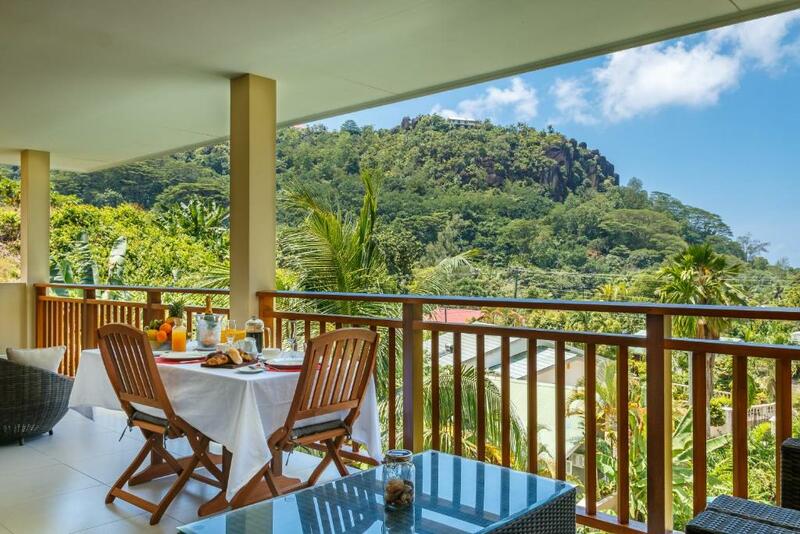 This property also has one of the top-rated locations in Anse Boileau! Guests are happier about it compared to other properties in the area. 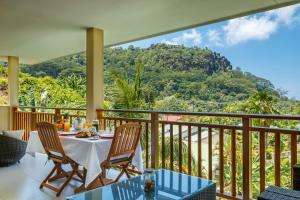 This property is also rated for the best value in Anse Boileau! Guests are getting more for their money when compared to other properties in this city. When would you like to stay at Eden Hills Residence? This 2-bedroom apartement has a tiled floor. It offers 2 private bathrooms and offers garden, mountain and pool views. One of the bedrooms is offered as either a king, or twin bedded room. This 1-bedroom apartement offers a bathroom and has a small private garden. 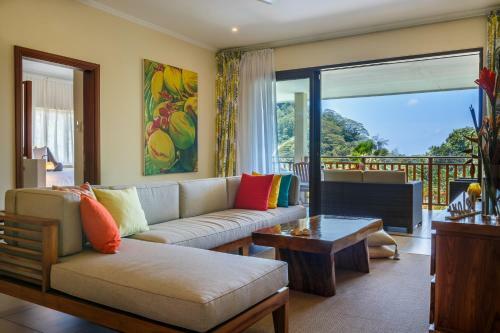 Located close to reception, this unit has garden, mountain and pool views. House Rules Eden Hills Residence takes special requests – add in the next step! Eden Hills Residence accepts these cards and reserves the right to temporarily hold an amount prior to arrival. Please inform Eden Hills Residence of your expected arrival time in advance. You can use the Special Requests box when booking, or contact the property directly using the contact details in your confirmation. This property I consider after looking in the island excellent value for money. To make this better the host Rachel was amazing as well as the rest of her staff. The welcome package is everything we needed to get us started. The apartment is meticulously clean and also the surrounding gardens and pool area. Would highly recommend. Nothing - it truly lived up to all our expectations. Rachel was an excellent host and all our needs were catered for. We arrived to a fridge full of food and drink and Rachel had kindly decorated the apartment with balloons and banners for our son's birthday and even provided a birthday cake with candles which was in the fridge - this was as much a surprise to us as it was to our son as Rachel kindly provided it without us mentioning it and also provided it to us free of charge. There was snorkelling equipment that we borrowed for the duration. The WiFi was excellent. We arrived to a lovely welcome drink and a plate of sandwiches too. We could not have wished for a better place to stay. It was conveniently located and great value. Very private and clean and the apartment was furnished beautifully and was spacious. The pool was fabulous too. Despite being tremendously nice and helpful, the owner was not able to improve the weather :) joking aside - everything was truly perfect. Everything was totally awesome: a large, clean, fully equipped and comfortable apartment, extremely nice and helpful owners and very nice view from a large balcony. We loved to stay here for our honeymoon! Everything was just perfect! Rachel is a perfect host, she is very helpful, nice and has a lot of good tips and advices for the guests. The place is really easy to find and close to the beach (5 minutes by foot and 1 minute by car), which is also the beach of the Maia resort and is really beautiful and not crowded (generally there are very few people on the beaches in Seychelles :) ). At Eden Hills was absolutley amazing to stay because there are just 5 apartments, parking place and also a big swimmimg pool for the guests. We had the apartment at the ground floor and there you get also a big terrace with a green zone and you can also grill overthere. You also have a private way to the swimming pool :) Our apartment was really nice, clean and with a good taste of design. The furnitures and everything was new and very comfortable. We had a whole well equiped kitchen. Rachel and her team was waiting for us at our arrival with fresh juices, sandwiches, fruits,a lot of snacks, wine, champagne and a lot of breakfast food and deinks in the fridge (the food was enough for us for a couple of days!). We even got 2 times a surprise breakfast plate with fresh pancakes/croissants and every singe day they got us some bottled water, coffee capsules, tea, biscuits and sometimes fresh fruits! The apartment was every day cleaned and the towels were replaced with new, clean ones. We did not except this kind of hosting and it felt so good!! We were amazed of everything. Rachel was very kind and she really takes care of her guests and we talked in some mornings about interesting things to know about Seychelles and the life there. Rachel and her husband has also a diving center and they offered for their guests a free snorkeling with boat. It was a very nice experience and they even came for us with car. All took aprox. Absolutely nothing, it was perfect. We had the garden apartment complete with patio and its own garden.. with enough privacy. breathtaking views, the food and the wine already bought, the appliances out of this world. Rachel waited for us as our flight was delayed and we arrived so late at night. It made our anniversary and my birthday absolutely amazing . the cake and message was a beautiful surprise. The wi-fi worked but it was very slow, perhaps it is too be expected in the Seychelles but that was literally the only thing. It was very modern and quiet. They had thought about everything! We also received a great home cooked meal from a staff member which was delicious! Just to find the location, it"s impossible without GPS because signs are very rare in Seychelles. Very good appartment ,it was over our expectations, Rachel and others people were really friendly we felt like at home. Do not hesitate to rent this accomodation because it will be without any bad surprises.